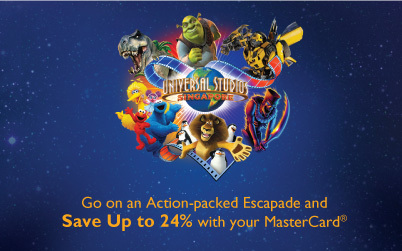 Universal Studios Singapore™ - Save Up to 24% with your MasterCard®! Applicable for on-site/ online purchase for park visits (excluding Super Peak dates). For on-site purchase, please state the MasterCard Promotion at the Universal Studios Singapore Ticketing Booth prior to the purchase. Each promotional bundle includes a One-Day Admission Pass to Universal Studios Singapore (USS) and One-Day Admission Pass to The Maritime Experiential Museum (Museum), each ticket is valid for one Guest use only. 1 Day Adult : $60, 1 Day Child : $45 and 1 Day Senior : $30 for both Non-Peak and Peak tickets depending on date of visit to Universal Studios Singapore. Promotion is not applicable for Universal Studios Singapore Super Peak dates (8 Sept 2012, 26 Oct 2012, 27 Oct 2012). Payment by MasterCard Credit or Debit cards only. Valid for purchase of up to 6 (Six) tickets per cardholder per day. Tickets are subjected to availability.